I found myself becoming more and more charmed by the northern coast of Spain with each day that passed. It was an unexpected kind of place — not the sunny, languorous Spain of the Mediterranean coast, but a jagged, slightly forbidding place that felt very different than the Spain I’d imagined for years. It felt remote, as if I were standing on the edge of the world. March 2018, single shot, additional exposures for highlights, focal length 32 mm, aperture f/11, shutter speed 21 seconds, ISO 31, ND 5-stop filter, tripod. It’s a place where the Atlantic and the Bay of Biscay have, over millennia, carved the coastline into sharp, unlikely formations. It’s less well-known than Spain’s Mediterranean coast and the tourists here are mostly locals taking short holidays. The comparative lack of tourists just added to my sense of being alone at the rough edge of civilization. 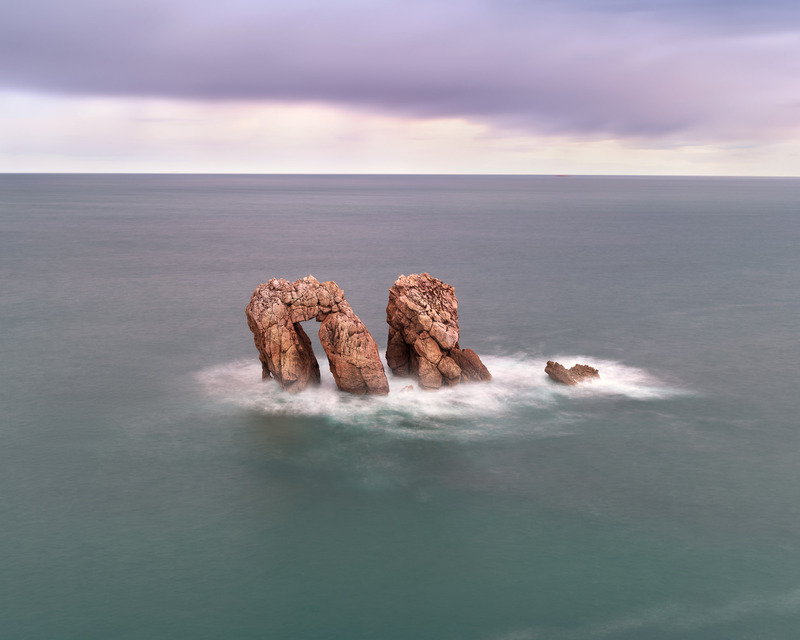 One of the more interesting rock formations along this stretch of the Cantabria coast is the Gate of Math, which I named so because of its resemblance to the symbol for Pi. Easily one of the most picturesque spots along a singularly beautiful coastline, I was determined to find the best angle to capture the formation. After trying several different views of the rock, I settled on the most straightforward, with the Gate of Math centered in the photograph. A storm was coming in, and I focused the formation with the clouds in the background, with just the faintest suggestion of danger on the horizon. I used a long exposure and an ND 5-stop filter to smooth the water and waves in the foreground to minimize distractions. I think the end result is striking — your eyes are drawn to the curious rock formation, which seems to hover just above the water, and the clouds on the horizon give a hint of something ominous. This entry was posted in Landscape and tagged Bay of Biscay, Cantabria, Spain.